Enid Blyton (1897 - 1968) was, and remains, one of the most popular of authors for children. Her books made her a household name: her magazine writing for children put before the public much of her day-to-day life: a life lived in the leafy English countryside that seemed blissful and idyllic. We now know, particularly from Barbara Stoney's biography of Blyton, 'the whole story behind this hardworking, complex, often difficult, child-like woman, whose relationships with those close to her were not always of the best and whose life was far removed from the sunny world she created in her writings. '1 Among those who were close to her, and who failed to come to terms with her complexity, was her first husband, Hugh Alexander Pollock.2 Pollock was a native of Ayr, and this brief note is an attempt to marshall what we know of him. William Smillie Pollock and his wife Jessie Smith McBride had two sons. After his death in 1942, the younger, William Alfred ('Fred'), who had previously become a partner, succeeded him in the business, which became a limited liabilty company c.1947. 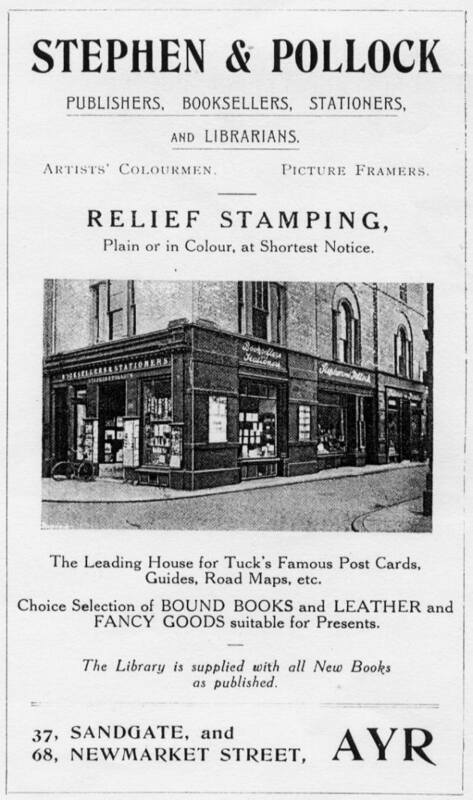 Fred Pollock died in 1954.12 About 1972, the business was taken over by Holmes McDougall Ltd., but the shop closed a year or so later, ending a long connection between this corner and bookselling. Blyton's complex character led her to forbid any contact between Hugh and his daughters; she moved quickly to change their surname from Pollock to Waters, and at this point he drops completely out of their lives. He was not blameless in the break-up of the marriage: he had recruited the novelist Ida Crowe to his staff at Dorking, and begun an affair with her. He married her in London in October 1943, six days after Blyton's marriage to Kenneth Waters.19 The published works on Blyton convey no further information on Pollock: the separation from him was complete and utter. Of his subsequent life, very little is known: when Stoney began to research Blyton's life, neither of his daughters knew where he was, or whether he was still alive. As Gillian (Baverstock) recalls, in her introduction to Stoney: 'My Father [sic] ... died just after Mrs Stoney had discovered where he was then living. '20 In an interview she gave to the Bradford Telegraph & Argus in May 1999,21 Baverstock implies that latterly Hugh and Ida Pollock lived in Malta, and that he died there, probably in 1971, the year in which Stoney began to research Blyton's life. Hugh Pollock seems to have been a victim of war. The First World War destroyed his first marriage, and he perhaps never escaped from the traumas of that conflict; the Second World War hastened the end of his second marriage. In terms of fame and public recognition, he was overshadowed by Blyton. All-in-all, it is perhaps not surprising that he turned to drink, flirtation and endless drumming. This article was first published in Ayrshire Notes No.21 (2001). 1 Taken from the publisher's blurb on the back cover of Barbara Stoney, Enid Blyton: The Biography, London, 1992 paperback edition [hereafter, Stoney]. Stoney's book was first published in 1974, and a revised edition was published in 1992. 3 Even within the family, there appears to be no consistent view as to whether the name is MacLehose or Maclehose. 4 Ayr Advertiser, 2nd January 1851, 1e. 5 Ayr Advertiser, 21st April 1910, 4g. From Maclehose's obituary, which is essentially identical to that which appeared in the Glasgow Herald, 15th April 1910, 8f. 6 Ayr Advertiser, 7th January 1864, 1c. Carreen S Gardner, Printing in Ayr and Kilmarnock, in Ayrshire Collections, Vol.12, no.1, [Ayr], 1976, 69, lists one work printed by R Maclehose in Ayr, the Reverend William Grant's 'Why we Came Out in 1843 - A Sermon', with a publication date of 1875. 14 Ayrshire Post, 20th September 1946, 6f. 16 Smallwood, op cit, 13 and 21. 18 See Stoney, Smallwood, op cit, 65-69, and also the introduction to Enid Blyton, The Story of My Life, London, revised edition, 1986. 21 www.thisisbradford.co.uk , seen 19th August 2001.